“At the same time, justified and sinner.” This is Luther’s appraisal of the Christian condition. Wesley, who owed much to Luther for his doctrine of justification by faith, stressed that the Christian must be not only justified, but sanctified. In the following post I show how Wesley defines salvation as the entire process which begins at conversion and is completed after death. I will address each of Wesley’s phases of salvation in the Christian life, taking particular note of his much mis-understood doctrine of Christian perfection. “the entire work of God from the first dawning of grace in the soul, till it is consummated in glory”(SW-44). Wesley understands salvation to “consist of two parts, justification and sanctification”(SW-44). Justification is the instantaneous forgiveness of sins that happens at the moment of faith (SW-45). Sanctification is the process whereby the justified becomes holy. This real change to holiness is additional to the relative change of justification. It is a process that begins at conversion and generally entails years of gradual change but happens substantially in an instantaneous gift of God, often just before death. With these definitions in mind, let us consider the phases of Wesley’s vision of the Christian life, from its inception to completion. The first phase of the Christian life is properly pre-Christian, but it is not absent of God’s grace. How does one cross over from unbelief to faith? Wesley expresses belief in prevenient grace consisting of “all the drawings of the Father” including the common human desire for God largely known as the “natural conscience”(SW-44). Wesley adds that the prayers of others help one find faith: “that person who long groans before [God] for the conversion of another, whenever that soul is converted to God, is one of the chief causes of it”(PA-440). Prayer is the cause inasmuch as it inclines God to effect a change of heart, for it is God’s Spirit who assures of love, whereby the unbeliever trusts (SW-47). What is this faith and what are its effects? Wesley describes faith as “a divine evidence and conviction...that Christ loved me and gave Himself for me”(SW-47). Faith is knowing that one is a child of God (SW-47). The effect of faith is justification, for faith alone is sufficient for justification although “repentance and fruits meet for repentance” are necessary also, if “time and opportunity” permit (SW-48). The fruits of repentance, or works, do not cause justification (nor sanctification), for alone they are worthless, but it is incumbent on all who are justified to be zealous of good works” (SW-49). Justification is the “forgiveness of all our sins”(SW-44) and the “immediate effects of justification are the peace of God...and a “rejoicing in hope of the glory of God” with joy unspeakable and full of glory”(SW-45). So great are the effects of justification mentioned above that the justified sometimes feel for some time that they have been fully sanctified because of their great peace and disinterest in sin (PA-381, SW-45). This feeling is attributable to the beginning of the sanctification process in which the believer feels internally the change from an “earthly, sensual, devilish mind, into ‘the mind which was in Christ Jesus’”(SW-45). While sanctification begins at justification, it is not completed with it and soon the “bosom sins” of the justified resurface and the flesh wars against the new indwelling Spirit (PA-380-381, SW-45). The life of the babe in Christ is lived in inner conflict and is to be full with striving “by the Spirit” for sanctification by good deeds and efforts to ‘“mortify the deeds of the body”’(SW-46). Wesley instructs these young Christians to believe that sanctification is possible merely on the basis of faith and that God can give it (SW-52-53). They live out this belief in the practice of doing good works of piety and mercy as they “wait for complete sanctification”(SW-51). Though the justified experience inner conflict, “Even babes in Christ are so far perfect as not to commit [outward] sin”(PA 375). What they wait for in prayer is not the ability to resist temptation but the gift of God which perfects their hearts in love for God and others, and which wipes away their desire for sin. How might the babe in Christ achieve, or rather receive, this perfection? Wesley parallels the means by which perfection is received to that by which justification is received: “Exactly as we are justified by faith, so are we sanctified by faith”(SW-49). The faith that sanctifies includes the belief that God has promised perfection in Scripture, and is able and willing to do it now (SW-52). Wesley is clear that faith alone is sufficient for sanctification, but he is inconsistent on whether all who believe are instantaneously made perfect. While he says “every man when he believes is sanctified [italics mine]”(SW-49), he more consistently teaches that most who have been justified by faith do not become perfected before the “instant of death, the moment before the soul leaves the body”(PA-446). The same faith that guarantees immediate justification guarantees eventual sanctification. That this is Wesley’s view is confirmed by the surprising fact that Wesley never claimed to received, Christian perfection. With faith, repentance is “in some sense, necessary to sanctification” even as it was to justification, but this post-justification repentance is of a different character than its antecedent (SW-50). The repentance of the justified is not motivated by guilt, but by the conviction that sin still remains in the heart, even if it has been mostly rooted out of ones actions (SW-50). Good works do not sanctify, but they are required of both the justified, and the perfected (SW-48-50). If Wesley never received perfection, why was he so convinced it was possible? Wesley’s reading of Scripture and his conviction that God’s commands do not exceed his promises are the primary source of his doctrine (PA-408, 389). Some of the Scriptures that occur repeatedly in defense of his doctrine include: ‘“The Lord thy God will circumcise your heart (Duet 30:6)’”; ‘“...church, not having spot or wrinkle...holy and without blemish’ (Eph. 5:25-27. )”; ‘“Be ye perfect, as your Father who is in heaven is perfect’ (Matt 5:48)”; “Thou shalt love the Lord thy God with all thy heart, and will all thy soul and with all thy mind’(Matt 12:37)”(PA-389-90). The second proof for Wesley of his doctrine of perfection is the examples of it, both in Scripture, and in his acquaintance. In Scripture, he points to “St. John and all those of whom he says ‘Herein is our love made perfect...’ (1 John 4:17)”(PA-390-391). As for contemporary examples, Wesley gives a case study of Jane Cooper (PA-409-414). Wesley explains the scarcity of indisputable examples by 1) the inconvenience it would be to the perfect, 2) the envy of those who seek them as well as, 3) their dullness and unwillingness to believe (PA-390, 387). When, by the gift of God, Christians attain perfection before death, how is it known and what are the limitations of this perfection? 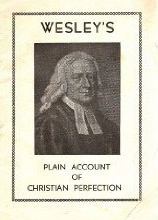 While Wesley denies that there can be certainty about who has been perfected, he suggests three markers: 1) prior “exemplary behavior” which suggests they would not attempt to glorify God by pretending; 2) Ability to give a “distinct account” of the time and place that perfection occurred; and 3) the appearance that “all his subsequent words and actions were holy and unblamable”(PA-398). The limitations of Christian perfection in this life are best approached by remembering the content of this perfection. It is perfection in love of God, whereby all desire for sin is removed, and perfection in love for neighbor with additional benefits of peacefulness (PA-393). Wesley’s perfection is of heart and will, not mind and body. Consequently, “they are not perfect in knowledge...nor from mistake,” “they are not free from infirmities” and they are not “wholly freed from temptation”(PA 374). Perfection in heart or love is not perfection in body or mind. The perfected one is yet imperfect in body, and thus vulnerable to sickness and death, but also is imperfect in mind. The one who is perfect in love but imperfect in knowledge makes mistakes but does not commit sins. Sin, properly so called, is “a voluntary transgression of a known law” while a mistake is an “involuntary transgression of a divine law”(PA-396) that is done out of “pure love” (PA-397). The gift of perfection does not include perfect perception, and hence these are not so perfect as to be beyond need of Christ’s atoning work. The perfected Christian is not outside of the reach of temptation, for even Christ was tempted (PA-374). The persistence of temptation in this life, as well as “numerous instances”(PA-442) leads to Wesley’s changed opinion that even the perfect may fall from perfection. “They who are sanctified, yet may fall and perish”(PA-422,426) and yet those who fall can recover perfection. In fact it is common “for persons to lose it more than once, before they are established therein”(PA-427). Wesley encourages those who do slip from perfection back into sin not to hide it for this would be a great peril to their souls (PA-435). The perfected experience consistent peace and joy, for perfect love casts out all fear (PA-371). Though this element is of great benefit to the perfect, it is exceedingly difficult to identify because the perfected Christian's mind may be distressed, sorrowful, perplexed, anguishing and in agony while the heart and will are at peace cleaving, and submitted to God (PA-399). According to Wesley, all who reach death justified are then, if not before, perfected in love. This perfection grows “to all eternity”(PA-426). He says little about how the perfect change in glory, though he does assert that “absolute perfection” is for God alone (PA-442). Wesley also hints that the limits of human knowledge in this life are overcome in glory (PA-442). Presumably, he agrees that the frailty of our bodies will be shed as we take on glorified bodies. John Wesley’s doctrine of salvation includes crucial elements of Lutheran and Catholic thought. With Luther, Wesley asserts the absolute cause of salvation, in both it parts, to be faith, and not works. With Roman Catholicism, Wesley teaches that the Christian life includes real change toward real holiness of which works are a part. God wills for those whom God has saved from sin’s punishment to escape its grip. Wesley believes that God can and does give this gift of a heart filled with pure love, not only to the dead in Christ, but also to the living. *This essay was written in 2007 as part of my Master's student. I recalled it and am posting it thanks to my work as a Teaching Assistant in Reading the World, an integrative course which draws in historical, theological, and sociological considerations. Citations refer to the pagination of a reader in Post-Reformation and Modern Theology provided by Dr. John Thompson. John 6:44 No one can come to Me unless the Father who sent Me draws him; and I will raise him up on the last day. What is the meaning of John 6:44? 1. Does it mean only a few, who have been selected by the Father, will be saved? No, it does not. 2. Does it mean that men only respond to the gospel because of irresistible grace? No, it does not. WHO ARE THOSE THAT THE FATHER DRAWS? John 6:45 It is written in the prophets, 'And they shall all be taught of God.' Everyone who has heard and learned from the Father, comes to Me. The Father draws all who hear and learn. The Father does not force anyone to hear or learn. Men have free-will. God does not impute faith into a few so they will believe and be saved. Faith does not come by injection. HOW DO MEN HEAR AND LEARN? Romans 10:13-14 for "Whoever will call on the name of the Lord will be saved." 14 How then will they call on Him in whom they have not believed? How will they believe in Him whom they have not heard? And how will they hear without a preacher? Men need to hear the gospel before they can learn and believe. The Father draws men by the gospel. Faith comes from hearing the gospel. Faith does not come because the Father selected a chosen few, before the world began, to be saved. All who accept Jesus as Lord and Savior are the chosen and that includes whoever accepts God's terms for pardon. Faith does not come because of irresistible grace. God the Father draws men to Jesus with the gospel. IT IS THE GOSPEL THAT DRAWS MEN TO JESUS! IRRESISTIBLE GRACE IS NOT THE METHOD THAT THE FATHER USES TO DRAW MEN TO JESUS. Romans 10:21 But as for Israel He says, "All the day long I have stretched out My hands to a disobedient and obstinate people." Israel as a nation rejected the gospel. How could that be possible if irresistible grace were in play? Israel turned away from God. Matthew 23:37 "Jerusalem, Jerusalem, who kills the prophets and stones those who are sent to her! How often I wanted to gather your children together, the way a hen gathers her chicks under her wings, and you were unwilling. Jerusalem was unwilling to be drawn to Jesus by believing the gospel. They had a choice. John 5:39-40 You search the Scriptures because you think that in them you have eternal life; it is these that testify about Me; 40 and you are unwilling to come to Me so that you may have life. The Jews had the opportunity to believe the gospel of Jesus Christ, but they were unwilling. There was no irresistible grace in play. The Father draws all who are willing to believe the gospel. John 6:40 This is the will of My Father, that everyone who beholds the Son and believes in Him will have eternal life, and I Myself will raise him up on the last day." IF YOU ARE READING THIS BLOG YOU ARE ONE OF THE "EVERYONE" WHO HAS A CHANCE TO BE BELIEVE THE GOSPEL AND BE SAVED. GOD DOES NOT REJECT MEN DUE TO NO FAULT OF THEIR OWN. THE FATHER DRAWS MEN TO JESUS THROUGH THE PREACHING OF THE GOSPEL. MEN ARE NOT DRAWN TO JESUS BECAUSE THEY WERE PRESELECTED FOR SALVATION! I'm all for another Hulk film. Giant Awesomesauce rolex datejust replica robots developed by Tony Stark. Maybe Loki can create some internal havoc within the team making everyone untrusting of the Hulk? Perhaps rolex replica Banner can delve deeper into his rage in order to be strong enough to stop the big bad, and the consequence of that action is a loss of control? I don't know, I just don't want a movie where the entire time Hulk is the number one target. The process of writing a thesis announcement comes before any actual custom essay writing servicestage when you begin to begin writing your thesis, and what is required of you. The thesis announcement is a announce about your subject and what you predict displaying or disproving. Hey, John Wesley’s Teaching is the first systematic exposition of John Wesley's theology that is also faithful to Wesley's own writings. Wesley was a prolific writer and commentator on Scripture—his collected works fill eighteen volumes—and yet it is commonly held that he was not systematic or consistent in his theology and teachings. On the contrary, Thomas C. Oden demonstrates that Wesley displayed a remarkable degree of internal consistency over sixty years of preaching and ministry. This series of 4 volumes is a text-by-text guide to John Wesley’s teaching. It introduces Wesley’s thought on the basic tenets of Christian teaching: God, providence, and man (volume 1), Christ and salvation (volume 2), the practice of pastoral care (volume 3), and issues of ethics and society (volume 4). In everyday modern English, Oden clarifies Wesley’s explicit intent and communicates his meaning clearly to a contemporary audience. Both lay and professional readers will find this series useful for devotional reading, moral reflection, sermon preparation, and for referencing Wesley’s opinions on a broad range of pressing issues of contemporary society. Thanks all!! !